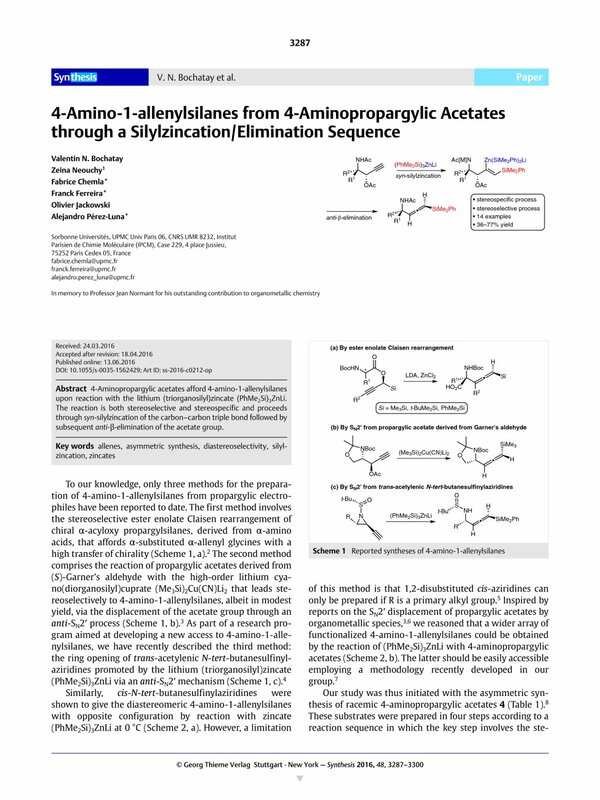 4-Aminopropargylic acetates afford 4-amino-1-allenylsilanes upon reaction with the lithium (triorganosilyl)zincate (PhMe2Si)3ZnLi. The reaction is both stereoselective and stereospecific and proceeds through syn-silylzincation of the carbon–carbon triple bond followed by subsequent anti-β-elimination of the acetate group. Supporting information for this article is available online at http://dx.doi.org/10.1055/s-0035-1562429. 1 Current address: ESPCI ParisTech, PSL Research University, Laboratoire de Chimie Organique, UMR CNRS 8231, 10 rue Vauquelin, 75231 Paris Cedex 05, France. 9 A sub-stoichiometric amount of (PhMe2Si)2Cu(CN)Li2 (0.9 equiv) was employed at –80 °C in order to avoid nucleophilic attack of the copper species on compound 5a; for a discussion, see ref. 4. 10 (PhMe2Si)2Cu(CN)Li2 was prepared as follows: CuCN (17 mg, 0.19 mmol) was introduced into a Schlenk flask and heated for 2 h at 160 °C under vacuum. After cooling to r.t., the Schlenk flask was flushed with argon and anhyd THF (0.12 mL) was added. The resulting suspension of CuCN was cooled to –10 °C prior to a 0.4 M soln of PhMe2SiLi in THF (0.89 mL, 0.36 mmol) being added dropwise. The reaction mixture was stirred for 30 min, cooled to –80 °C and immediately used. 11 Vinylsilane 6b could be isolated and characterized by 1H NMR, 13C NMR and IR spectroscopy, and HRMS. 18 It is worth noting that 1.1 equivalents of SiBNOL–zincate complex reacted sluggishly with 4-aminopropargylic acetate 4a. No reaction occurred at –30 °C in THF, whereas a modest conversion of 35% was observed within 14 h at r.t. affording 4-amino-1-allenylsilane 5a with high stereoselectivity (dr >98:2).